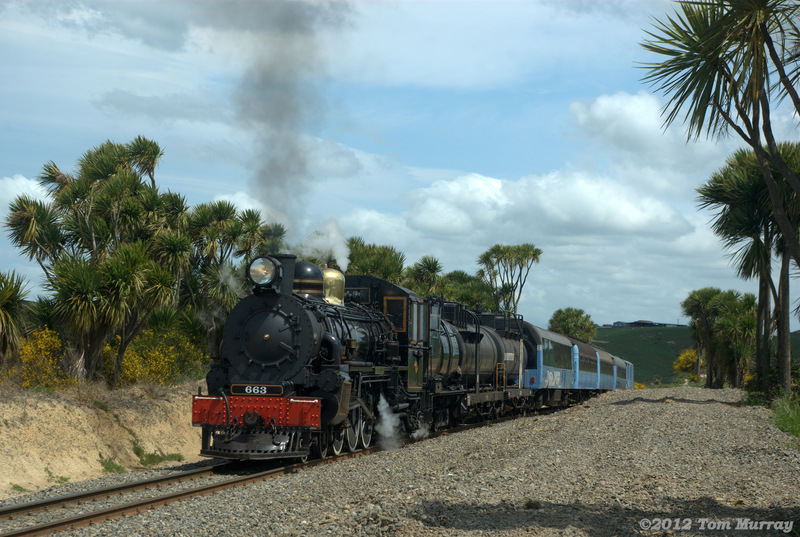 Before my wife and I traveled to New Zealand for the first time in 2012, I had studied the online timetables of KiwiRail Scenic Journeys, the passenger arm of the country's national railway, and I had identified other rail operations that I wanted to see or ride while in the country. But I never found an up-to-date guide to New Zealand's railways – freight, passenger, and tourist – that would tell me (or any other overseas rail enthusiast) how the various pieces fit together. My article "Making It Work" in the February 2014 issue of Trains, is part of an effort to fill that gap. In it, you'll learn some basic facts about New Zealand's geography, the development of its rail system, and where you're most likely to see freight trains in this island nation. You'll also see some excellent photos of KiwiRail trains taken by New Zealand photographers. However, for the North American railfan thinking about making the 12-hour-plus flight to see this beautiful country, there's still more to know. New Zealand’s rail system is surprisingly varied. In addition to mainline freight operations on a 2,481-mile network with both diesel and electric motive power, as described in the article, it has tourist-oriented scenic passenger trains, commuter rail service in two metropolitan areas, and two major operators of steam-powered excursions plus a number of smaller heritage railways. The report below will give you a few pertinent facts about each of these services, plus a list of Internet resources for learning more. Depending on the time of year, the visiting railfan could easily spend two weeks or more riding trains in New Zealand. Here are some of the opportunities that await. KiwiRail Scenic Journeys operates three tourist-oriented trains, one on the North Island and two on the South Island. Re-equipped over the past two years with coaches (carriages to a Kiwi) constructed at the company’s Hillside Shops in Dunedin, the trains offer a service that, while not exactly premium, is certainly on a par with many of the scenery-oriented trains of Europe. The new cars have panoramic windows, comfortable seats, and automatic doors. Light meals and beverages are available in a café car on each train. On a nice day, passengers flock to the open-air viewing platform on the generator car, which will be at one end of the train or the other (the platform can easily accommodate 20 people or more). The train crews exude the friendliness for which Kiwis are known. To connect the North and South islands, KiwiRail operates frequent ferry service across Cook Strait. • Northern Explorer (Auckland-Wellington). Operates year-round, three days per week in each direction, departing each terminal just before 8:00 A.M. and arriving at the final destination roughly 11 hours later. Scenic high points include the brief segment of coastal running next to the Tasman Sea north of Wellington, the views of three active volcanos approaching National Park station from the south, and the Raurimu Spiral just north of National Park. Railfan tip: keep an eye out for freight trains powered by Class EF electrics on the 256-mile electrified segment between Palmerston North and Te Rapa (north of the Hamilton passenger station). • Interislander ferry (Wellington-Picton). The 58-mile crossing between Wellington and Picton takes three hours. 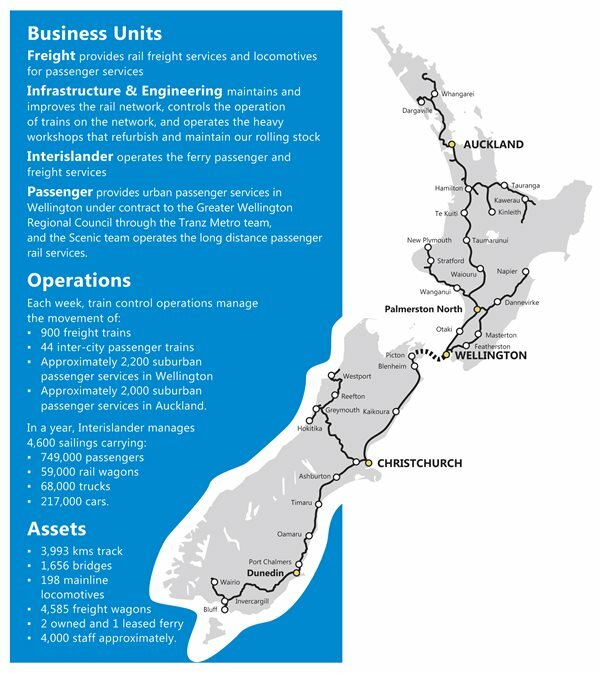 There are generally five Interislander crossings in each direction daily, using KiwiRail's fleet of three vessels. The ferry run through Tory Channel and Queen Charlotte Sound at the north end of the South Island can be one of the most scenic parts of a tourist’s visit to New Zealand. Passengers and motorists also have the option of a competitive service known as Bluebridge, which operates two ferries on the same route. • Coastal Pacific (Picton-Christchurch). If you arrive at Auckland International Airport, as most international passengers do, and then take the Northern Explorer to Wellington and the Interislander ferry to Picton, your next rail journey (during the summer months from late September through early May) will be aboard this train, which leaves Picton seven days a week at 1:00 P.M. and arrives at Christchurch’s Addington station just before 6:30 P.M. The northbound trip leaves Christchurch at 7:00 A.M., arriving Picton just after noon, to connect with an Interislander sailing to Wellington. This is a scenic trip from start to finish, but the high point is mile after mile of seaside operation north and south of Kaikoura. On the side opposite the ocean you’ll see the beautiful Seaward Kaikoura mountain range. Best option: make a reservation to stay a night or two in Kaikoura, and spend some time train-watching (all trains stop here to change engineers) and the rest soaking in the scenery on the gorgeous Kaikoura Peninsula Walkway. KiwiRail's seasonal Coastal Pacific, en route from Picton to Christchurch on the South Island, departs Kaikoura, the midpoint of its run. • TranzAlpine (Christchurch-Greymouth). This is the best known of the three scenic trains, and remains a tourist favorite despite the damage to many popular hotels in center city Christchurch from the severe earthquake of February 2011. It makes the round trip to Greymouth each day, departing Christchurch just after 8:00 AM and returning at about 6:00 P.M., with an hour scheduled at Greymouth where you can get a quick lunch. Or, you can get a light meal in the café car, and walk around town during the layover, making sure to get a photo of the restored signal box near the station. The scenery is topnotch, especially east of the summit at Arthur’s Pass, where you’ll see snowcapped mountains from one side and deep river gorges from the other. On the westward trip the Otira bankers (a three-unit helper set whose main task is to assist eastbound coal trains) will couple to the head end of your train for braking on the 3-percent descending grade through the long Otira tunnel. Both Auckland and Wellington have commuter rail services, most of which offer off-peak schedules that give a visitor the opportunity to make a trip out to a suburban location and return without a major investment of time. • Auckland: Service is provided from the underground platforms of the Britomart station in the central business district. It’s operated by Transdev (formerly Veolia) under a contract with Auckland Transport, using the MAXX brand name, on two principal lines: Western, to Waitakere, and Southern, to Pukekohe. A third route, the Eastern line, runs separately out of Britomart, serving five stations, and then joins the Southern line at Westfield, continuing on to Pukekohe. In addition, there is one two-station spur line (the Onehunga line) and one single-station spur (to Manukau). The Eastern line may be the most scenic of these, operating via a causeway over Hobson Bay and the Orakei Basin between Britomart and Meadowbank, with nice views. Auckland services have long operated with locomotive-hauled and diesel multiple unit equipment, but these lines are currently being electrified between Swanson in the west and Papakura in the south. New 25kV AC EMUs from Spanish manufacturer CAF have begun to arrive in Auckland for the commencement of service on the Onehunga line, to be followed by the other routes over the next two years. The Waitakere station on the Western line and the Pukekohe station on the Southern line will remain diesel-served for the foreseeable future. • Wellington: The Greater Wellington Regional Council offers service operated under contract by KiwiRail, under the Tranz Metro brand, on five routes totaling 96 miles, of which 59 miles is electrified using a 1500V DC system. The Wellington Railway Station is at the north end of the downtown business district, a short walk from the New Zealand Parliament buildings. Electrified routes include the 6.5-mile Johnsonville line, the 30-mile Kapiti line to Paraparaumu (the southern segment of the North Island Main trunk), the 20-mile Hutt Valley line (the lower portion of the line that continues through the Rimutaka Tunnel toward Masterton and Woodville), and the 1.9-mile Melling branch, which connects with the Hutt Valley line. Diesel-powered Tranz Metro trains use the Hutt Valley line as the first leg of the trip to Masterton. Two types of EMUs are currently in service on the Wellington electrified routes: 25 Class EM/ET cars built by Hungarian manufacturer Ganz-Mavag in the early 1980s; and 48 Class FP/FT units built by South Korea-based Hyundai Rotem/Mitsui beginning in 2008. Eventually the Class FP/FT units will completely supersede the Class EM/ET cars. KiwiRail also operates a commuter train, the Capital Connection, that departs Palmerston North for Wellington each weekday morning, returning in the evening. Equipment consists of a KiwiRail diesel and specially painted, refurbished British Rail Mark 2 carriages. The Wellington Station platforms and a connecting overhead pedestrian bridge offer good vantage points for viewing the action here. Wellington EMUs, old and new. On the left, an early-1980s Ganz-Mavag car; on the right, a 2012 Hyundai Rotem/Mitsui "Matangi" car. While in Wellington, be sure to set aside time for a ride on the Wellington Cable Car, whose 2,000-foot, five-station route runs uphill from Lambton Quay, a 10-minute walk from the city's railway station. • Taieri Gorge Railway: This operation is based at the well-maintained 1906 Dunedin Railway Station, an architectural gem a few minutes’ walk from the city center. Regrettably, since the discontinuance of the Christchurch-Invercargill Southerner in 2002, there is no intercity rail service to the station. But the Taieri Gorge operates a robust schedule, especially during the summer season. Twice a day, trains depart for Pukerangi, on the former Central Otago Railway route, a four-hour round trip, 35 miles each way. The first seven miles are on the KiwiRail main line south of Dunedin, and the next 28 are on the Central Otago route, most of it following the course of the Taieri River. The very scenic trip features 12 bridges (including the southern hemisphere’s largest wrought iron structure) and ten tunnels. Twice a week, trains operate beyond Pukerangi to Middlemarch, a six-hour round trip from Dunedin, 42 miles in each direction. On an irregular schedule, averaging six times monthly during the summer, trains run north out of Dunedin 40 miles to Palmerston, a four-hour round trip, much of it within view of the Pacific and other bodies of water. All trains are powered by Dj Class diesels built by Mitsubishi in the late 1960s, with a B-B-B wheel configuration. A Mitsubishi-built Class Dj unit leads the Taieri Gorge Railway's twice-daily train from Dunedin to Pukerangi over Deep Stream. • Mainline Steam Heritage Trust: This organization was founded by Wellington businessman and locomotive collector Ian Welch in 1988 and has expanded since then to include a roster of more than a dozen locomotives, of which four are currently certified for mainline operation, including one Class Ka 4-8-4 and two Class Ja 4-8-2’s, plus more than 20 carriages. Equipment storage and maintenance facilities are located near Auckland, Wellington and Christchurch. Mainline Steam operates several one- and two-day excursions each year on both North and South Islands, and in some years it runs a three-week New Zealand Steam Tour that covers most of the country’s major rail routes. • Steam Incorporated: Based in a former New Zealand Railways shop at Paekakariki, about an hour north of Wellington, this group owns a number of steam and diesel locomotives. At this time, Class Ja 4-8-2 1271, constructed in 1956, and Australian-built Class Da 1431 (a 1957 A1A-A1A version of EMD’s G12 export model), are in service. 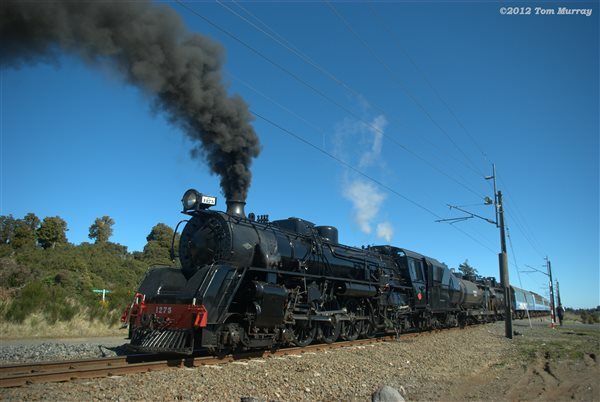 It also has 12 carriages for use on excursions, most of which operate in the southern half of the North Island. Class Ab 663, a 4-6-2 delivered in 1917 by New Zealand Railways' Addington Shops near Christchurch, leads one leg of Mainline Steam's 2012 New Zealand Steam Tour. Here, it crests the 1-in-53, or 1.9-percent, Papatawa Bank between Palmerston North and Napier (Kiwis refer to a grade as a "bank"), passing a stand of cabbage trees, common in many parts of New Zealand. New Zealand Railways 4-8-2 Ja 1275 was constructed by North British Locomotive Company of Glasgow in 1951. The engine remained in revenue service until 1968. Here, it leads Mainline Steam's 2012 New Zealand Steam Tour at Horopito, on the North Island Main Trunk between Waiouru and Taumarunui . • Glenbrook Vintage Railway, located between Pukekohe and Waiuku (about an hour south of Auckland), and operated in conjunction with the Railway Enthusiasts Society, has its own equipment and five miles of track, and also operates excursions on KiwiRail lines around Auckland. • Silver Stream Railway, in the Hutt Valley near Wellington, has a substantial collection of preserved steam locomotives as well as several diesels. Currently, four steam and three diesel locomotives are in service, as is a 1930 diesel railcar. • Ferrymead Railway, operated by the Canterbury Railway Society, Inc., is located near Christchurch, at the site of New Zealand’s first railway. It has a large collection of equipment including steam, diesel and electric locomotives, and a variety of passenger carriages and freight wagons. Silver Stream Railway, in the Hutt Valley near Wellington, operates this 2-6-2, constructed as a shunting (switching) locomotive. 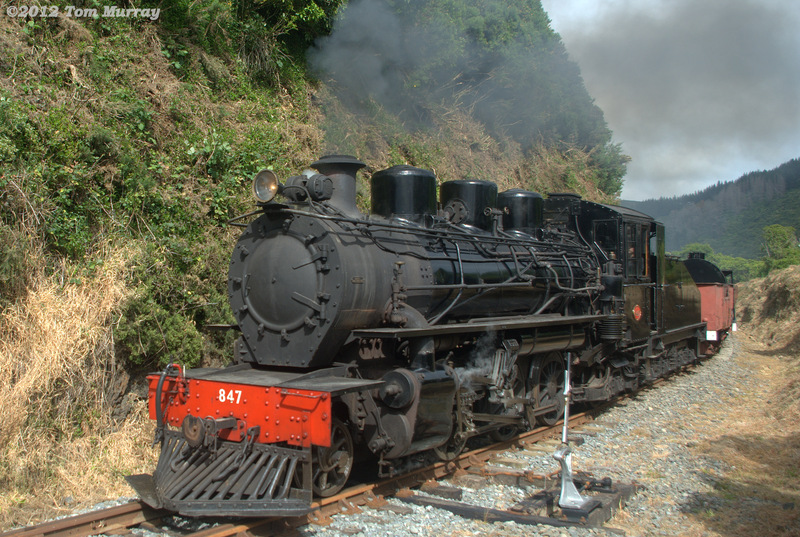 Kiwi practice is to include the locomotive class as part of the engine number, so this Class C engine is known as C 847. This engine was constructed at Hillside Shops in Dunedin in 1930 and remained in revenue service until 1969. If all of the above isn’t enough, then look into the options for hiking and biking abandoned and mothballed rail lines. New Zealand is a country where both locals and visitors spend vast amounts of time outdoors, enjoying the pure air and green landscapes. The Otago Central Rail Trail on the South Island, which extends more than 90 miles beyond the end of the Taieri Gorge rail route, from Middlemarch to Clyde, is one example. There are even a couple of private operations on the North Island (one near Rotorua in the east, the other between Taumarunui and Stratford in the west) that offer trips over inactive rail lines on flanged-wheel, golf-cart-sized powered vehicles! There's plenty of information available about all of the above on the Internet. Following are links (current as of December 2013) to the web sites of the services listed above. Finally, for those who want to know what else there is to do in New Zealand besides riding, watching and photographing trains, I'll put in a plug for a report about the seven-week visit that my wife Marcia and I made there in late 2012. You can find it on our personal travel blog at tomandmarcia.blogspot.com.